I was young, both figuratively and literally, the first time I ate at Daniel. That was five years ago. My friend and I were treated like the dishwasher’s stepchildren. I exaggerate, of course. But Daniel was clearly a place for fancy pants that I’ll never get to wear. Service aside, Daniel’s food wasn’t very memorable. I mean, for the small hill of cash we laid down, we shouldn’t have walked out of the restaurant with holes in our stomachs. Hue and I walked back up to his place on 85th and stopped in at the Hot ‘n Crusty for some giant, fresh-out-of the oven cookies for a satisfying midnight snack. I still have my menu from that night. Hue and I saw upwards of ten plates between the two of us, and all I remember was the gingerbread-crusted terrine of foie gras and a lovely duo of beef (which, if I’m not mistaken, is a standard menu item). Older and just a smidge wiser (cynical? ), I figured it was time for me to give Daniel another chance. I borrowed my mother’s birthday as an excuse. My reservation and dinner-planning with the staff got off to somewhat of a rocky start. Thankfully, those issues were resolved in due course. And our dinner, too, launched on a wobbly foot. Judging by our 10-minute wait with no water, no bread, and barely a greeting, the kitchen and the front of the house (or at least the captains) seemed to be in the weeds. Service smoothed out after that first half hour, though pacing with the first two courses was noticeably stretched. We ordered the 3-course prix fixe ($105) and supplemented two dishes apiece. We also selected from the cheese cart (normally a $24/$31 supplement, this course was taken off our bill for reasons not explained to us). And the kitchen sent out an extra dessert. CLICK HERE to see all of the photos from this meal. Or, click on the course titles for the individual photos. 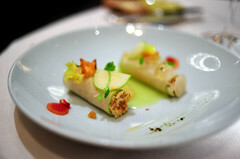 Celery, Walnut Oil, and Granny Smith Sauce. Artichoke Purée, Anise Hyssop Dressing, Lemon Zest. Yellow Curry Braised Greens, Crispy Rice, Chayote. Root Vegetables, Ommegang Abbey Ale and Gingerbread Sauce. Fall Squash, Barberries, Brown Butter Chicken Jus. Celery, Caramelized Salsify, Beets, Walnut-Calvados Jus. A selection from the cheese cart. Caramelized Walnuts, Sheep’s Yogurt Sorbet. Almond Biscuit, Orange Mousse, Mirabelle Sorbet. 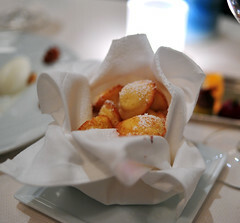 Jean-François Bruel has been with Daniel Boulud since 2001, when he started as a sous chef at Cafe Boulud under Andrew Carmellini. 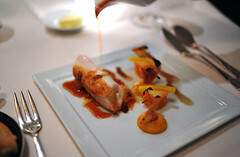 In that same year, Bruel moved on to open db bistro modern as the chef de cuisine. After three years there, he moved up to the flagship, where he has since earned the title of Executive Chef. For the most part, Bruel’s cooking is good. But it’s not exciting. More problematic, some of it isn’t properly executed. My mother’s “Slow-Baked Dover Sole” – mistakenly served to me – was overcooked. 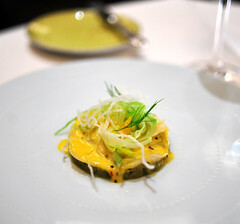 I had Dover sole prepared almost identically (with different accompaniments) at Alex at the Wynn earlier this summer. Whereas Alex’s rolled cigar of fish was evenly and completely coated with a crisp, golden nut crust, the one at Daniel was largely denuded of its crust, a fragment of which clung to one side. (A simple exercise: compare the Alex version to the Daniel version.) Whereas the sole at Alex was delicate and fine, the exposed surface of the fish at Daniel had clearly seen too much heat, or had sat under a salamander for too long – it was tough and a touch dry. Reminiscent of cream of mushroom soup, the rich, stew-like mix consisting of porcini mushrooms and chunks of the darker and tougher cuts of hare meat in my highly anticipated “Wild Scottish Hare à la Royale” was over-salted. 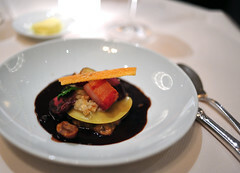 That stew was sandwiched between two discs of pasta – an open raviolo of sorts – and topped by two medallions of loin meat, brunoise of sunchoke, shaved porcini, a roasted shallot, and slab bacon. The carefully assembled stack, surrounded by a moat of civet sauce,** was barely recognizable as my beloved lievre à la royale. Like many of Bruel’s plates, it was overwrought. The plating style at Daniel is incredibly intricate. The number of components and minute garnishes tweezered onto each plate boggles the mind. Micro herbs balance, just so. A dab of something here and a brunoise of another thing over there. A dash of powder on the side. And sauce – don’t forget the sauce – is drizzled table-side around it all. I got tired just looking at it all. There’s no doubt that Bruel’s technique is quite impressive. His checkered terrine of foie gras (a signature Daniel dish that I happened to first encounter at the James Beard Awards a couple of years ago) is exemplary of his skills as a classically trained chef. But one wonders if time would be better spent focusing on perfecting a fewer number of elements. The excessively fussy plating aside, the majority of our meal was quite good. The “Maine Peekytoe Crab Salad,” which featured two cannelloni made with tissue-thin green apple shavings and stuffed with a lightly dressed crab salad, was refreshing. It was my mother’s favorite dish. The daringly under-cooked scallopine of cod in my “Olive Oil-Poached Cod ‘En Salade’” were exquisite. Tender as the day is long, they melted in the mouth. I was initially taken aback by the tepid temperature. I was expecting it to be warm. But after a couple of bites, it became very clear that this temperature was absolutely correct. The very essence of Provence, the fish was dressed with a fragrant anise-hyssop dressing shot through with lemon and just a touch of heat. The “Foie Gras-Stuffed Scottish Grouse” was excellent as well. 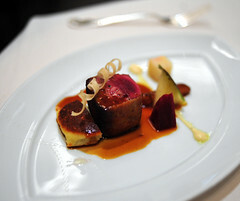 There wasn’t much foie gras, but this grouse didn’t need it – it was tender, juicy, and robust. If there was one knock out dish, it was the “Turbot Baked on Himalayan Salt.” The baking process had miraculously coaxed out the gelatinous quality of the fish, rendering the two, flat filets extremely delicate, almost custard like. Though the servers had inadvertently swapped my fish with my mother’s, they failed to swap the sauces. So, although the turbot was supposed to come with an ale and gingerbread sauce, it got the brown butter chicken jus. It was a pretty fantastic mistake. That delicious sauce tied the fish and the assorted root vegetables (salsify, parsnip, etc.) up in a tidy, comforting, and homey bundle of flavors. That ale and gingerbread sauce, unintentionally poured over the sole, went well with the squash-heavy theme (pumpkin, kabocha, etc.) in that dish as well. In an unexpectedly delicious way, it was like eating a savory pumpkin pie. The hiccups with our fish and meat courses aside, our second course presented the least compelling dishes. Both the “Maine Sea Scallop ‘Rosette’” and the “Butter-Poached Abalone” were overwhelmed by their sauces, which were applied in thick order. While the saffron velouté was delicious, together with the thick layer of fennel marmalade underneath the thin slices of scallops, it completely obscured the character of all else. The beefy flavor of the abalone managed to barrel through its rich blanket of curry cream. But the star in this dish – served in an abalone shell – was the underlying bed of tender braised greens. Though it wasn’t necessarily tough, the abalone could have been a touch more tender. If there were crispy rice and chayote in this dish (as the menu indicated), I certainly overlooked them. You’d never know we were mending a broken economy by the way the restaurant looked. Both the lounge and dining room were packed. And although a few tables in the dining room sat empty between services, their reservations arrived promptly to fill them back up. Service wasn’t as brusque as last time. But it was a touch aloof – unintentionally smug? And I’m still having problems understanding the waitstaff’s version of English. At least this time, it was categorically franglais, which I can understand. I have no idea what kind of English was being spoken last time. 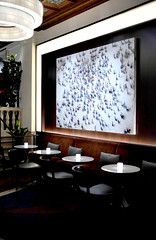 A brief word on the new interior design: His name is Adam Tihany, and he likes circles. Lots of them. Daniel, when I last left it, was choked with red velvet. Now it’s etched and hung with circles. If I thought that light fixtures at Jean Georges looked like a flying saucer convention, the mother ship hovers over Daniel’s dining room. Its spiraled sister holds court over the new Aureole. I can’t say I like what Mr. Tihany did with Daniel. While he certainly succeeded in modernizing the interior, I can’t say I think he improved it. He certainly didn’t simplify it. The dining room is fraught with discordant colors and shapes. The “centerpiece” that sits against the back wall (you face it as you walk into the dining room) – a shelf of flower vases and decorative glassware – looks like my desk after I’ve tried to tidy it: organized chaos. The layout of the room really hasn’t changed much. I would like to think they’ve removed some tables. But I can’t be sure. All I know is that I would not want to sit anywhere on the balcony west of the entrance to the dining room. The tables along the western balustrade – though framed by a stunning, floor-to-ceiling wine rack encased in glass – seemed to be the landing strip for the kitchen. That corridor also seemed to be quite narrow – making accessibility for the cheese cart questionable. 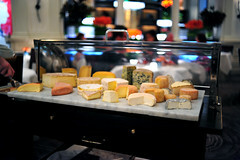 For diners seated in the sunken center area of the dining room, the cheese cart is manually lowered (and lifted) by two servers. Our desserts were very good. Although Dominique Ansel’s pastries are every bit as carefully constructed as his counterpart’s savory dishes, they don’t seem nearly as busy. 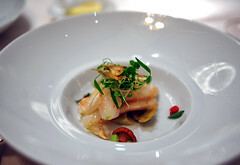 His plating is clean and crisp, and so are the flavors. The various components all work toward one unifying flavor profile. 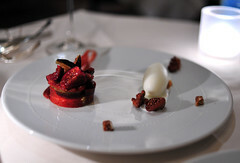 My “Roasted Black Mission Figs,” glazed with red wine and garnished with caramelized walnuts, was dark and serious whilst my mother’s “Sake-Glazed Plums,” with a bright mirabelle sorbet and airy orange mousse, was lighthearted and refreshing. Very different from each other, both were very good. The kitchen also sent out a bonus chocolate dessert as a birthday gift for my mother. It was very well-made, but no more or less than just another chocolate dessert. I’ve been to Daniel twice, and neither experience would I categorize as excellent. This last visit was a touch better if only because the service was a little warmer. But it was far from perfect. Mistakes like inadvertently swapped dishes (worse, sauces!) shouldn’t happen at the three-star level. At a large eight-top next to us, servers tried to put down desserts with no silverware. 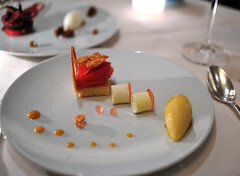 The desserts retreated – not all the way to the kitchen, but rather to the side, ice creams amelting – while back waitstaff scrounged for utensils. And when we left the restaurant – albeit late (but by no means last) – we found a group of servers sitting in the lounge shooting the breeze with each other. One of them, a notably young gent who had greeted us when we arrived, had the decency to stand up and bid us good-bye. Service aside, the food wasn’t uniformly excellent. Their bread could be warmer, or at least not cold. Not that I expect there to be a bread oven on the lower shelf of the cheese cart, but it always makes me die a little on the inside when I see pre-sliced bread being kept and served from there. They might want to check the cooking of their sole and the seasoning in their lievre. 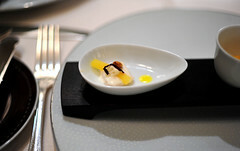 And to be quite honest, I was a little surprised to see two of our amuse bouches recycled onto the sole dish. Delicious, sure, but a bit unimaginative. Perhaps not wiser, I’m reassured that I am older and still cynical. Oh, and few hundred dollars lighter. * In addition to the menus posted online, there is an additional list of “daily specials” offered at the table. Among the dishes that night was a smoked salmon first course and a couple of white truffle offerings (supplements offered in various amounts). ** Although traditionally, civet sauce for lievre a la royale is made from the blood of the jugged hare, its importation is prohibited by the clean freaks in our government. For various reasons, it’s nearly impossible for the restaurant to obtain. Besides, it doesn’t make the smoothest sauce. As I surmised (confirmed with the server), Daniel uses pig’s blood instead of hare’s blood, which easier to obtain and results in a smoother product. When I first asked our server, he seemed hesitant to admit it. But once I reassured him that I was quite comfortable with that concept, he seemed almost overjoyed to tell me I was right. 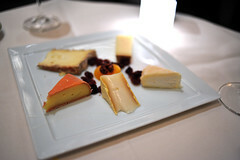 *** The cheeses were fine, but the Brunet was exceptional; it was my favorite. ~ by ulterior epicure on November 23, 2009. Excellent report, as usual. In our meal at Daniel last August we also thought that the food was not close to three-star cuisine, but our experience with the service was quite different; it was gracious, prompt and efficient. Great report as always. Oh my god what did they do to the dining room … makes me sad. @ Michael: I’m glad that your service was better. The food here is by no means bad. But it just failed to *pop. * The execution errors were definitely unwarranted. And I would agree – not close to three-star level. @ Adam: Thank you. I’ve seen more hideous interiors, to be sure. But I can’t say I like the Tihany make-over. It’s so macédoine. Wow, I didn’t heard about this topic until now. Thanx. @ KD: Nope. They were both brownish sauces and I’m certainly not keen enough to have been able to tell them apart based only on sight. I suppose, if I had been a bit more wary, I would have smelled them. But at a place like Daniel, such suspicion really shouldn’t exist. I just jumped right in. Of course, on the first bite of the sole, I realized the mistake; gingerbread and ale are rather distinct flavors. I confirmed the mistake when I tasted the sauce on the turbot plate. That was unmistakenly chicken jus – very rich and very good.